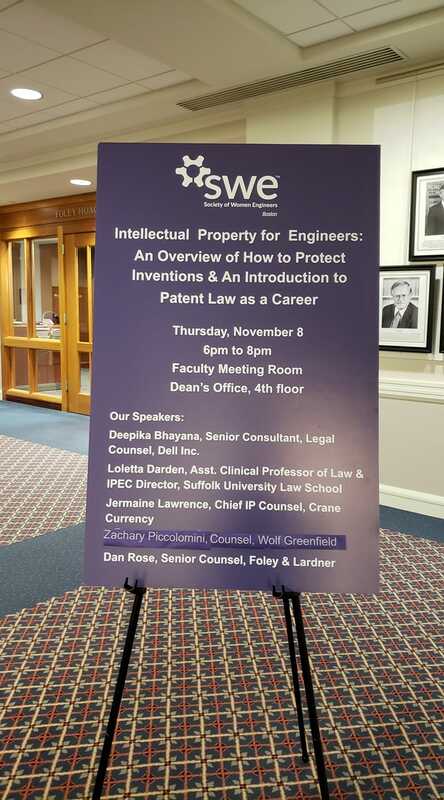 Join us for an overview of intellectual property law, as well as information about what a career in patent law looks like. You’ll hear from law firm lawyers, as well as lawyers practicing as in-house counsel. Light appetizers will be served. Getting here: Located directly on the Freedom Trail, public transportation is the most direct route to Suffolk University, with the Red Line’s Park Street station half a block away. We are also within walking distance of the Green Line’s Government Center, and the Orange Line’s Downtown Crossing stations. For those driving, there are several parking garages in the area: the Center Plaza Garage with entrances on Somerset and Tremont Streets, and the Boston Common Garage (enter from Charles Street between the Common and the Public Garden), are the closest. Deepika Bhayana, Senior Consultant, Legal Counsel, Dell Inc.
Suffolk University is the leading intellectual property law school in New England, with a highly developed technical specialist program and graduates working in Intellectual Property departments at EMC, Alnylam, Biogen, Citrix, Ironwood Pharmaceuticals, Gillette, Hasbro, Nike, Reebok and more.